Kim Il-sung, North Korea's founder, had seen the devastation wrought by the bombs dropped on Japan in WWII and witnessed the obliteration of the Korean Peninsula by Allied forces in the Korean War. Almost from the start Kim Il-sung desired to develop his own nuclear weapons program. But his desires were placed on hold as more pressing issues were on the table at the end of the Korean War, namely, rebuilding the country and completing his restructuring of the entire economy, military and culture. With the Soviets as allies, North Korea felt relatively safe from American "imperial aggression" and so they went about more basic national concerns. However, they engaged in lower level nuclear activities with the USSR. In 1956 their scientists were given basic knowledge on how to begin a nuclear program and in 1959 the DPRK and USSR signed a "nuclear cooperation" agreement. The collapse of the USSR marked the beginning of many changes in North Korea. It precipitated the famine, helped to wreck their economy, and a few years later they restarted their nuclear program after losing their primary defensive shield - the Cold War threat of all out nuclear war with the ruin of the US. Their nuclear program had been on hold since 1994 but in 1998 they tested a ballistic missile and restarted processing nuclear fuel. Today, North Korea lacks any ability to sustain a long-term, full-scale war. 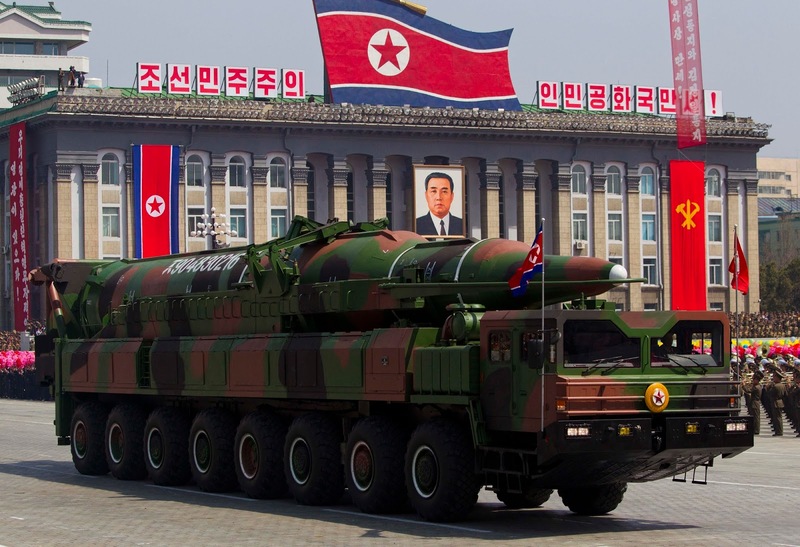 Most of their tanks and other weapon systems are around 25-30 years old and many sit idle or broken because North Korea lacks sufficient fuel, replacement parts and even bullets. But we should not let that lull us into a false sense of security. The North Korean soldier is one who is strongly motivated, loyal to the point of religious zealotry, and is constantly reminded that all of their problems are directly caused by the US. For us, the Korean War ended in 1953. For the North Koreans, it's still happening. The country's leadership knows full well that without Soviet and Chinese support during the War the North Koreans would have been wiped off the face of the earth...and they very nearly were. And so today, they see South Korea flourishing, they see thousands of US troops stationed in the South and they realize they probably can't count on Russia or China in the event of a new war. At the same time, they also remember that prior to the early 1980's they had a stronger economy and better infrastructure than their southern cousins. So, what is a tiny country with a schizophrenic superiority/inferiority complex to do? Their insistence on developing a serious nuclear defense program is one we find difficult to understand. After all, the money they've spent pursuing this goal could have fed the entire population for several years. We have to realize that what the national leadership does is for its own survival alone and not necessarily the well-being of ordinary citizens. For decades, North Korea has promoted itself to its people as a strong nuclear power and fully capable of sending satellites into space; at the forefront of any and all technologies. The reality is that they're bumbling about with little to go on except what they learned via the Soviets and their interactions with Iran, Syria and Iraq. Their brightest scientists are decades behind the modern world. And so, in an effort to ensure their legitimacy in the eyes of the people, and to reap the benefits of aid monies and arms deals, they have become hellbent on developing nuclear weapons and all the ancillary technologies that goes along with it. The military is the lifeblood of North Korea. The official policy of North Korea is "Songun" (military-first) which means, in essence, the entire purpose of the nation, its economy, agriculture, technology, everything is to serve and enhance the military. And while the Kim family seems like they have had an iron-fisted grip on the county's affairs the reality is that they (more precisely, he; Kim Jong-un) must maintain an uneasy alliance between himself and the military leadership. It would go a long way toward cementing his rule if the military was well taken care of, which would include a nuclear arsenal. Where does all this leave us today? The first question deals with sanctions. The US and UN has levied multiple rounds of sanctions against North Korea since 2004. The problem with this is sanctions more often than not hurt the people of a country more than the leadership. Sanctions have attempted to squeeze the ruling elite into submission, in reality they have played right into their hands. The sanctions have drastically limited the amount of fuel oil and other necessities flowing into the country thus exacerbating their economic problems and hampering the ability of everyday Koreans to thrive. Exceptions have been made in the realm of food aid but this too has had a negative effect. By their very nature any aid that goes to North Korea must first go through government bureaucracies and the military is usually the one who ends up with the aid. Then soldiers take truck loads of food and sell it on the black market fueling the corrupt and the terminal kleptocratic state of the country. The international community has also failed to realize that what constitutes "luxury goods" to the West is not what people in North Korea consider luxury. A simple TV is a luxury good in the North, not necessarily a gold-plated toilet. And the elite have had little problem getting their "luxury" goods since the UN doesn't provide a strict list of what exactly luxury means, rather they let each member country determine what is or isn't. Sanctions, normally US led, also fits into the propaganda. By engaging in sanctions and severely harming their domestic economy the North can easily blame all their woes on the US and can use them as an excuse to use their sovereign imperative for self-defense by citing a "need" for a nuclear deterrence. So, while sanctions may make the West feel good about "stopping a rouge regime", the North is busy working their starving people into a frenzy of anti-American sentiment, ready to wage war at the drop of a hat. Not to mention that despite sanctions the North has recently tested two nuclear devices and multiple long-range rockets. Sanctions are clearly not working. Furthermore, North Korea is not as dependent on outside help as one might expect. Their successful "satellite" launch in 2012 was a prime example. Based on the examination of rocket parts found in the ocean the world was shocked to discover that much of the rocket was domestically made. North Korea also has a fair amount of natural uranium deposits (32,000 TONS of pure uranium to be exact). Uranium enrichment is a rather straightforward process and the technical skills needed to produce a uranium-based nuclear device is much less than needed to produce a plutonium bomb. All of this tells us that while sanctions may make things difficult for the North, they are not preventing them from moving forward with their programs...obviously. The next question is a rather simple one, what is the real threat? North Korea, more a socialist nightmare than utopia. A broken economy and starving people with an obsolete military. What could they possibly do? Well, obviously they can build nuclear weapons and place objects into orbit and we dismiss or poke-fun of North Korea at our own risk. There is no way the North could currently launch a nuclear missile (or any missile) at the US mainland and even dream of hitting it with any certainty. Theoretically, they could however send a bomb over in a shipping container. The North has been able to maintain an arms, drug and information trade with multiple nations the world over so it is conceivable that they could blow up the Port of Los Angeles by sneaking something on board one of the 8 million shipping containers (using another country as a 3rd-party mediator) that flow through the port. After all, ports are a notorious weak spot. More realistically, I think we should focus on South Korea and the mood within the North. When Kim Jong-un came to power as a young, European educated man, the world hoped for real reforms. Unfortunately, it seems that the young Kim suffers from youth induced arrogance and a desire to prove himself to his people (undoubtedly egged on by seasoned and hawkish military advisers). The North has also been "gearing-up" for war since 1953 and I imagine that the citizenry is growing tired of constant war propaganda without ever releasing the tension. Historically, North Korea has engaged in small hit & run tactics such as the sinking of the ROKS Cheonan and the bombing of Yeonpyeong Island or limited incursions. In fact, the North has technically violated the terms of the 1953 Armistice 221 times. So there is little question that the North is capable of hits, the question is, are they ready to engage in a full blown war? Politically speaking, the time is ripe for an escalated conflict. We've seen the North take provocative actions but now South Korea has also stepped up its rhetoric. The newly elected ROK (Republic of Korea) president has made it clear he is willing to be much more aggressive in the face of any threat from North Korea and this willingness on both parts will make it very easy for an otherwise small event to blow up into war. North Korea maintains a secretive and elite rapid strike force of about 180,000 men. These troops are well trained in asymmetric tactics and have a network of tunnels beneath the DMZ which, in the event of war, means that the South could be taken off guard as 180,000 enemy soldiers surround their forward defensive lines. Additionally, Seoul is within reach of thousands of field guns and rocket launchers which could inflict massive damage. North Korea could use its 500-forward deployed, long-rang guns to rain down 500,000 shells an hour for several hours. All of this would result in up to 1 million South Korean casualties within the first few days of war. Not to mention the rest of the North Korean military which in terms of raw numbers dwarfs the South's. And while the North lacks any real ability to engage in a sustained invasion, the goal may not be to "win." Like the Taliban, the goal could be to bleed the US dry. We would be forced (by treaty) to send large amounts of aid and soldiers to back up the 28,500 US soldiers already stationed in the South and to help the South Korean military. The disruption in trade between the US and South, as well as the disruption of South Korea's overall $560 billion in global exports, could cause very real economic problems for the "enemies" of North Korea. In the end, North Korea would be turned into a pile of ashes, as was the case during the Korean War but, not without costing the US and its allies a great deal first. I doubt North Korea genuinely wants an all out war. The end game of war would be bad for everyone involved. It is more likely that the North is simply wanting some breathing room. If it weren't for their nuclear program it's doubtful the world would even give the North the time of day. But there can be a positive outcome. Although sanctions haven't worked to stop their weapons programs, they have succeeded in making life very hard for them and rumors of assassinations and internal power struggles surface from time to time. I think it is time we re-evaluate our position with North Korea. The North is like a spoiled child and our approach to keep him from doing bad things is by starving him to death. To me, this doesn't sound very wise -or moral. It is obvious that all of their bellicose language has been in an attempt to gain attention and aid. It is equally obvious that the international community lacks the ability to stop the North from doing as they please since they have a fair amount of domestic capability (even if it's at the expense of other sectors). At the height of the Cold War, during the Cuban Missile Crisis, both sides understood that any escalation would result in both sides losing. There is no doubt that while we would technically win the war, we would also lose it. Sanctions against the USSR did little to stop their activities and in the end the USSR collapsed from internal forces and a never-ending asymmetric war in the Middle East. Today, the US trades with many of our mortal enemies, Russia, China, Germany, Japan, Vietnam etc. Russia and China maintain militaries that could easily take our military to task if pushed to. Russian and Chinese human rights abuses are well known and their systems of government and economics are not the same as America's. That being said, the lives of modern Russians and Chinese are better now than at any point in history and at the same time the Chinese Communist Party has never been stronger. I am not saying that their horrid human rights record, or the deaths of millions caused directly by their governments should be ignored. I am saying that there are ways of opening up societies, of making lives better, without bombing the hell out of them or holding such threat above their heads. As is evident by Iraq, Afghanistan and Libya, you cannot bomb "freedom" into a culture unable or unwilling to accept it. Sometimes change must be gradual. The US and China have been at odds over rare-earth metals and there is a grave threat to the world economy if China decided to play bully. North Korea, surprisingly enough, has up to $6 trillion (yes, trillion) in rare-earth metals. Would it not make more sense to extend an olive branch to the North Koreans, to not demand the end of their ruling elite, and instead allow them to implement gradual economic reforms while we reap the benefit of another source of needed materials? Economic freedom breeds personal freedom. The only way for North Korea to really benefit from their natural resources is to change their economic model and in doing so the yoke of serfdom which pervades North Korean society will naturally lessen. As long as we threaten them directly or indirectly, they will never relent. Morally, North Korea does have every sovereign right to defend itself and to develop nuclear technologies, and we have no moral (or Constitutional) right to stop them. We do have the moral and legal right to trade with them and if they launched an actual attack against us then fine, we'll erase them from the universe. I would rather have a country of full bellies which still has a Kim leading it than further continue a nation where 1/3 of those under 5 have stunted growth as a result of malnourishment with a Kim leading it. I think we owe it to the millions of starving North Koreans, to our South Korean friends, and to ourselves to try a new path. Instead of holding on to Cold War fears and maintaining policies which clearly do not work, let us engage. The North Korean famine began in 1994 and lasted 4 years. The famine occurred as a result of several external and internal factors, namely: the loss of the Soviet Union's support for their economy and a series of floods which destroyed valuable crops and farm land. The USSR had been the closest of allies with the DPRK and the DPRK relied heavily on "friendly rates" for foodstuffs, fertilizer and fuel oil to support their economy. When the USSR collapsed the North Korean economy tanked and over the course of the 1990s their economy contracted by at least 50% and the floods in 1995 really pushed the famine into overdrive. During those 4 years an estimated 1-3.5 million people died either as a direct result of starvation or illnesses related to starvation. In North Korea this period is known as the "Arduous March" which was a reference to a propaganda story circulated in 1993. This propaganda campaign called on the people to summon up the strength and courage from the story "Arduous March" in which Kim Il-sung and his guerrilla fighters waged a heroic campaign against the Japanese, "fighting against thousands of enemies in 20 degrees below zero, braving through a heavy snowfall and starvation, the red flag fluttering in front of the rank." Part of the famine propaganda also included the "Let Us Eat Two Meals A Day!" campaign in an effort to preserve resources. The famine resulted in an entire generation having extremely high rates of stunted growth and mental retardation. 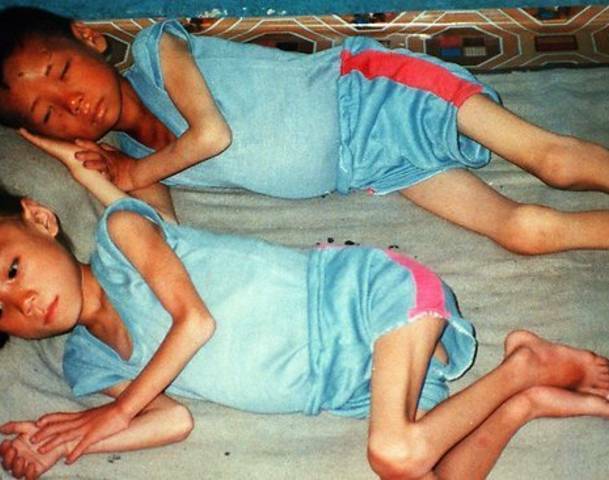 The UN estimates that 1/3rd of North Korean children under 5 are malnourished today. While the national famine itself has ended there are sporadic food shortages, flooding and regional famines which continues to this day. Stories of cannibalism, including parents eating their children, surface every few months. As I discussed in a previous post, North Koreans tend to bury their dead in mounds. So I would like to expand upon that topic and show you a number of examples. There are two types of mounds found in North Korea; the large mound and the small mound. Most probably modern mounds of the elite/martyrs. Next, a mound 'cemetery' with an anti-aircraft artillery site nearby. These mounds are located in a large city. Now, here are the small mounds. Nearly every example you can find of these come from the famine period. It is basically impossible to not find them dotting hillsides, in the midst of farmland, and near just about any city, town and tiny village. A large number of people were also buried in mass graves. As you can see, these were placed anywhere there was a spot of unused land with little order. In the middle of farmland. Here are 3 groups of mounds arranged in a rough triangular shape. I've circled them because they may not be very clear due to the image's lighting. I imagine that these were some of the first people to die and that the townspeople tried their best to put some care into their arrangement. As time went on, those who survived simply lacked the energy, time or resources to do more than a basic and quick burial. These mounds are scattered along the ridges of low-lying hills which the village below has grown in and around. Finally, here is a large-view image of the locations I have found so far. I try to mark all of the "elite" mounds (purple arrows) because they are far fewer and may be of special cultural/historical importance (I have no way to find out). The white arrows mark large areas of "common" mounds. The shear abundance of the common mounds makes it impractical to mark them all, especially since they are easily found, so I only mark the largest groupings in a given area. As I have mentioned before, North Korea is the most militarized country on Earth. They spend 20% of their GDP on their military (more than 5x higher than the US), males are required to spend 10 years in the military and at any given time 5-10% of their population is on active duty with an additional ~30% of the population in reserves or paramilitary units. The country has successive layers of defensive positions, most notably around Pyongyang. 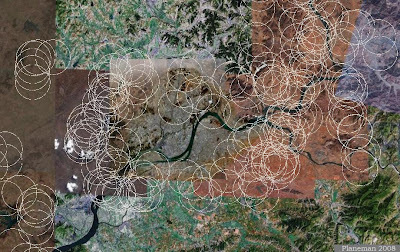 This shows the location of many Anti-aircraft artillery sites (AAA) around Pyongyang and their ranges are shown by the circles. 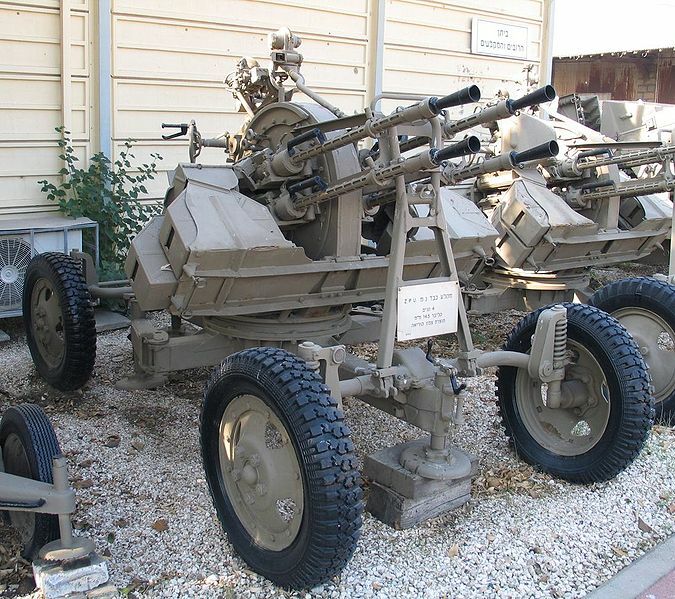 One of the most common AAA platforms is the ZPU-4, pictured below. This is just an example of the weapon and wasn't taken in the DPRK. It has a range of 8km. There are currently between 1,500-2,000 AAA and HARTS (Hardened ARTillery Sites) sites in North Korea. Due to their economic difficulties and sanctions it is likely that 20-25% of the sites are non-functional (lack of parts, repair capability etc). Although it is very likely that the sites around the capitol and the DMZ are given priority and are functional. While it is widely agreed that the technology and weaponry used by the DPRK is outdated and would offer little resistance to a full on assault by a modern military the fact that they retain such a vast number of guns and men under arms means that they represent a very real and credible conventional force. Plus, they have special units trained in asymmetric warfare thus any land invasion would be an arduous and costly undertaking. This realization and the ever-present reality that Seoul, South Korea lies within range of many of the North's weapon systems is why war cannot be considered as a series action. Should a war break out, within 48 hours it is estimated that South Korea could suffer 1 million casualties. There are two main layouts of their AAA sites and an asymmetrical layout. The most common is the "daisy" or "flower" design. This is an example of a linear site. A number of traditionally "daisy" sites have been converted to linear sites. An asymmetrical site. These are typically located along the thin ridges of low-lying hills or near populated areas lacking in uniform open spaces. During the 1970's there were many more sites but over the years they have been removed or consolidated. I can only presume that it is because they lack the funding to keep all of them operational and that over the years many of the guns have broken beyond repair. This is one such site. HARTS are largely a North Korean style of defense. They can take many forms but typically include AAA guns, SCUD missiles, SAM's, radar sites etc located in bunkers either cut into the side of a hill or in hardened facilities. Then they are rolled out into the open to be deployed. Some are also locations with gun positions cut into a hill or berm and are only covered by simple sheds. Although this might not sound all that secure the gun lines are very thin and are backup against a hill with tree cover. This presents a rather small target and depending on time of year they can be hidden rather well from aerial view. This is a typical position for the interior of the country. And here is one typical of the DMZ. Note the small sheds.